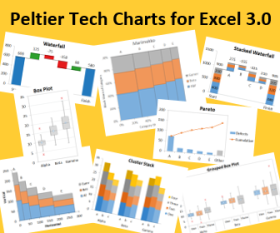 A user of my Peltier Tech Charts for Excel 3.0 asked recently whether this program could perform interactive formatting of all series 2 in a set of charts to the same color. But if you need something particular like this, it’s not hard to spin your own VBA code. Let’s look a little closer at one piece of this code, which determines whether to work on one chart (the active chart), multiple selected charts (selected using Ctrl+Click or Shift+Click), or all charts on the active sheet (if no chart was selected). I’ve color-coded the explanations and the code sections. If one chart is selected, then there is an active chart. The strange line of code “If Not ActiveChart Is Nothing Then” really means “If ActiveChart Is Something Then“, so we should process the active chart. If multiple charts are selected, the selection consists of a collection called “DrawingObjects“, so we should process each shape in this collection (which is also a “ShapeRange“), provided that shape contains a chart. Finally, if neither of these conditions are met (that is, no chart is selected), we’ll process each chart object on the active sheet. If there are no chart objects, the code will just finish up. How do I know all of this stuff? Well, I’ve been around for a long time, and I’ve swiped code from a lot of experts. The code above is pretty good, but it’s not very flexible. If you need to get the color from a different cell, you need to edit the command that references cell H5. You need similar changes if you need to format a different series. This is fine if it’s your own code, but not if the user is your colleague who isn’t VBA-savvy. So let’s add a couple mini-dialogs to ask the user what we should do. This makes it truly interactive formatting. Which Cell Has the Desired Color? 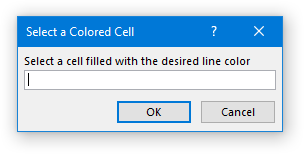 First we’ll use Application.InputBox to ask the user which cell is filled with the color we want to use. The 8 as the last argument for InputBox tells VBA to expect the user to supply a range. We use “On Error Resume Next” because if the user cancels the InputBox, “Set rng =” will return an error. Bypassing the error, if the user cancels, rng will not be defined, so we will branch to ExitSub, a label at the end of the procedure. If the user selects a cell with not fill color applied, the color white will be applied to the applicable series. This probably isn’t what you want, but at least the code doesn’t produce any ugly run-time errors. Which Series Should We Change? Next, we’ll use Application.InputBox to ask the user which series to change. Using 1 as the last argument for InputBox tells VBA to expect a number, while using 2 tells VBA it’s text; we’ve used 3, which means number or text (3 = 1 + 2). If the user cancels, what is returned is the Boolean value False (not the text value “False”). So we test for a Boolean, and if we get one, we branch to the ExitSub label as above. If the number or name entered by the user does not correspond to an existing series in the chart, an ugly run-time error occurs. It’s a little more complicated to bypass the error, but your users deserve the best. Well, that’s pretty nifty. But what if I have something besides a line chart? Now we’ll add the capability to check each series chart type, and use the appropriate formatting syntax to change the line color, the marker color, or the fill color. To keep from repeating a lot of this code for checking series chart type, I’ll introduce a function to call to change the series formatting. Using a function also means that if I need to change or enhance the feature, I only need to change it one time in the function, and not everywhere I use the feature. and it will still run like a sub, but then return the value True to bDidItWork if it formatted a series and False if it did not. You could then notify the user if one or more series were not changed because of their chart type. Should We Fill the Marker? We want to change the MarkerForegroundColor of any markers, but the MarkerBackgroundColor only if it is reasonable to fill the marker. For the Plus, X, and Star markers, filling the marker results in a big ugly square marker where the Plus, X, or Star foreground is not distinguished from the background. We could probably get more creative based on whether the existing background color matches the foreground, but this is just a blog post, eh? Posted: Tuesday, September 5th, 2017 under VBA.